'Moments Later' RB+ (Elm Jensen, R. 1989). Seedling Sto-Sto-pum. AB, 16" (41 cm). Early bloom. 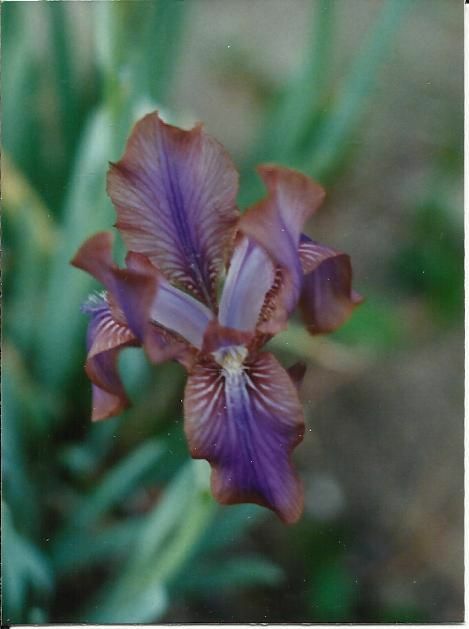 Standards medium beige brown, blue center, electric violet flush on midrib; Falls same, flushed violet and rose, white haft veining; orange beard tipped lavender; slight sweet fragrance. I. stolonifera x Stolpum sdlg. #1: (I. stolonifera x yellow pumila). Storybook Gardens, 1989.